4 slices of bread, crumbled. boil corn. remove from water and set aside to cool. remove kernels from cob. standing your peppers upright, remove the tops by slicing 1/2 inch from the stem. scrape out the seeds with a spoon. if pepper won't stand straight, trim the bottom to even it out, being careful not to make a hole. (very large peppers should be halved lengthwise through the stem and laid on their sides to bake). steam peppers over boiling water for 10 minutes. pat dry and stand upright in a lipped baking dish in which the peppers will fit snuggly. add ground chicken and saute til meat is tan in color, about 10 minutes. add tomato, garlic, jalapeno, Braggs and corn to skillet. saute over medium heat for 5 more minutes. transfer contents of skillet to a medium-sized bowl. spoon mixture into each upright pepper and place in the oven. combine bread crumbs with a drizzle of olive oil. it's important to lightly coat the bread, not soak it through. remove peppers from oven and sprinkle crumbs over each. brown the tops under broiler for 3 minutes if necessary. and voila! 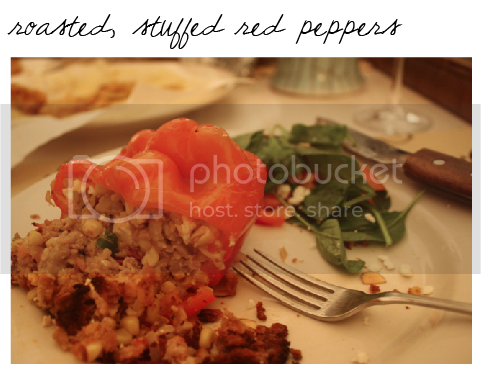 roasted, chicken-stuffed peppers. I think i've seen you post this before... i wanted to make it! I'm glad you've posted it again.. because i'm def. copying this and trying it this week! i'll let you know how it goes! xoxo THanks lovely!!!! I made these peppers last night with a side of roasted brussel sprouts. My housemates LOVED them. Thanks for the recipe! I love to cook, but really enjoy using recipes.